Before we went on this trip to Las Vegas, I asked my wife what show she wanted to see. Her response, “Blue Man Group“. This started a quest for decent discount tickets for the show. Online, I found some discounts at TravelVegas, but these seemed to lead straight to the hotel’s Ticketmaster site — meaning that on top of the ticket price, there would be the city taxes, venue fees, and Ticketmaster fees. No thank you. Instead, we ended up using the service we’ve used for all the shows we’ve seen this week: Tix4Tonight. I went down to the booth in front of the Aladdin Planet Hollywood yesterday, and got two mezzanine tickets for BMG for around $67, including fees. [I should note that we’re doing pretty good: Using Tix4Tonight, we’ve gotten tickets to three shows for around $260, meaning each show is roughly $40 on average]. Last night, we walked over to the Monte Carlo and saw the show. For $67, we ended up in the second row in the mezzanine in the center — perfect seats. The show itself? In a word, spectacular. 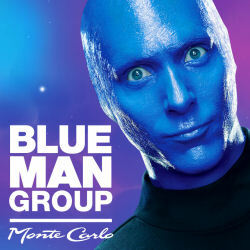 I’ve been trying to think of a way to describe Blue Man Group. I started with the phrase “childlike wonder”, but shortly realized that the Blue Men are simply a fancy form of clowns. They like to explore silliness, make people laugh, and just play with things. They submerge their individual identities to personas to focus people on the laughter. This is the essence of clowning. As for the show itself, it is hard to describe. Looking back, a number of things stick in my mind. First was the giant floating things that circulated through the audience before the show. There was the percussion and the lights, and the playfulness of creating instruments out of anything and everything. There was the audience interaction (I wonder if that woman in the first row ever got her credit card back). There were the robots. There was the playing with the food and the Twinkies. There was the GiPhone and the heavy use of lights. There was the penultimate ending, with balls floating everywhere through the audience and paper going all around. There was the actual ending, with the drums of color. In short… spectacular. One problem with Las Vegas shows is that they never provide a standard program or credit. That’s too bad. For what makes BMG successful is not only the three blue men (who are always never named), but all the musicians and technicians and staff behind them. That was certainly true last night: the musical team behind BMG was just great, and the technical work that goes into the show — from sound to lights to timing to projections to programming to playfulness — was remarkable. They deserve to be credited, and I acknowledge their efforts. Dining Notes: Before BMG, we ate a totally non-special dinner: Rubios in the Food Court. But before that was something spectacular: one of the few non-Starbucks coffee venues we’ve seen in a hotel: Sambalatte. Now I’m not a coffee drink, but my wife tells me that the coffee she had there was one of the best cups she’s ever had. Sambalatte has three locations. [I’ll note they were less spectacular for tea — they were using bags — but there are no spectacular tea shoppes in Vegas: there’s Teavana (which is Starbucks now), but they have limited non-flavored black tea options); there’s Coffee Bean and Tea Leaf, which is always good but is more coffee focused; and there’s … umm … Starbucks 🙁 ). Upcoming Theatre and Concerts: Tonight is our last Vegas show: “Evil Dead: The Musical” at the V Theatre in the Desert Passage Mall Miracle Mile Shops. Once we return, we’ve got a twofer day: “Hairspray” at Nobel Middle School followed by “The Lion in Winter” at The Colony Theatre (FB). The next weekend brings both “Porgy and Bess” at the Ahmanson and “Cat on a Hot Tin Roof” at REP East (FB). The next two weekends are currently unscheduled: Karen is helping Erin move, and there’s not that much calling to me from Goldstar. June is busy. It starts with a CDF Conference for Karen while I see “The Fantastiks” at Good People Theatre (FB). We lose the following weekend to a Bat Mitzvah. The remainder of the month brings “Stoneface: The Rise and Fall of Buster Keaton” at the Pasadena Playhouse (FB) on June 22, and “I’m Not Just a Comic Genius” at Secret Rose (FB) on June 27. July will be busy: “Ghost” at the Pantages (FB) on 7/5, “Return to the Forbidden Planet” at REP East (FB) the weekend of 7/12, “Once” at the Pantages (FB) on 7/19, “Bye Bye Birdie” at Cabrillo Music Theatre (FB) on 7/26, and “Family Planning” at The Colony Theatre (FB) on 8/2. August then remains quiet as we work around vacations and such, but things start to get busy again in September and October. More on that later. As always, I’m keeping my eyes open for interesting productions mentioned on sites such as Bitter-Lemons, and Musicals in LA, as well as productions I see on Goldstar, LA Stage Tix, Plays411. Next → Next post: We’re Alone in the Woods. What Could Possibly Go Wrong?